Happy Friday All! Today we are sharing some words from a woman that I thought could be “pretty cool” to hear from, who happened to turn out to be an absolutely incredible person who we are so honored to have featured on the site! I love, love, love, when it works out like this! Yes, Candi Brooks is an amazing and inspirational actress, dancer, former casting director, and overall wonderful human being! I first recognized Candi in one of the finest comedic films of the last ten years, a little film called 21 Jump Street (featuring our old pal Johnny Pemberton!). She was the young woman who was gently removed from your light pink VW bug during one of the most hilarious car chase scenes in cinematic history. She in turned actually helped save the day by stashing heat in her glove compartment. It was a hilarious scene, and I was excited to ask Candi all about it. And as it turned out, there happened to be so much to know and love about her! Candi is also a long time resident of my favorite American city, which is obviously New Orleans. She joins the ranks of so many different folks we have featured on the site who call NOLA their home. Candi was kind enough to give us just a bit more insight into what it is like to work in the world of casting directing and acting in one of the greatest cities on the planet. And we are so damn grateful that she did! So Ladies and Gentlemen, please allow me to shut my digital mouth, and introduce to you all the brilliant Candi Brooks! When did first discover your passion for the world of performance? Was it something you grew up dreaming about, or did you just sort of find your way into it one day? I began dancing at a young age (around 3 years old). Tap, Jazz, Ballet, until later years I also took on Hip Hop, Pom Pom, Musical Theatre, Lyrical, Ethnic, & traditional Native American Jingle. I adored being on the stage with the lights, sequins, makeup, and a captive audience!! My years of dance continued until my early teen years where I auditioned for a Performing Arts High School in Georgia called Pebblebrook. It was here I made the choice to begin studying drama instead of dance and the love has never stopped growing. After High School I went on to earn a BFA in Musical Theatre from an amazing 4 year program at Brenau Womens College (shout out!) & Gainesville Theatre Alliance. I then did summer stock under the direction of Broadway’s legendary Terrence Mann at The Lost Colony. I took an internship at Actor’s Express and worked locally in Atlanta market until joining a National Tour of Peter Buffet’s all Native American cast as the lead female singer/dancer titled Spirit The Seventh Fire. Once we lost funding on tour I wound up in Louisiana with zero ideas of what to do next. I signed with a talent agent and began the transition of becoming a film/television actor. In 2009 I took a 2 week job as a reader for Liz Coulon of Coulon Casting and 7 years later retired with dozens of shows under my belt as a Casting Asst & Associate having worked with some of the best! Beyond the world of acting, you are also quite the acclaimed casting director in your neck of the proverbial and actual woods down in NOLA, along with our friends and your fellow performers Laura Cayoutte, Joe Chrest, Ted Alderman, L. Michelle DeVito, and others. I am always curious to learn about film communities in areas that aren’t L.A. or NY. So in your experience, what is the film community like where you reside? What do you believe sets it apart from other communities? Wow! *blushes* Thank you for such kindness. Star studded list of folks you just rattled off there! 🙂 The film community here is deep rooted in folks that have been here since the beginning navigating every growth spurt our community has experienced (both in front of and behind the camera), as well as transplants (like myself) whom have moved here for work or otherwise and chosen to stay; and fairweather folks whom come in for the job and then are on to the next! We are a melting pot of cultures, ethnicities, accents, & styles from street to street and neighborhood to neighborhood. There is something for EVERYONE here and I think there is atleast one person whom represents all of these different vibes as well. The majority of the actors here are hustlers, but this is not their entire being. They are book readers, adventure seekers, parents, pet owners, travelers, & lovers of life! We make great story tellers because we are living lives outside of the stories we’re telling on the screen & stage. Other communities I’ve experienced only live for those experiences and so when they’re not acting they’re not fulfilled. 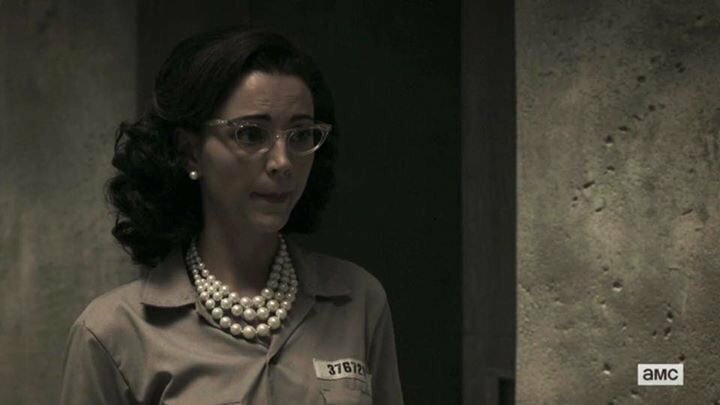 Candi Brooks as “50’s Hair” on the hit AMC series, Preacher. You worked as a casting director and had a brief but hilarious bit of screen time in one of the greatest comedies in recent years, which would be 21 Jump Street. You were involved in the very intense car chase scene that is an absolute highlight of the film. So I am just curious what it was like to work on a set like this one? Was it as fun to work on as it was to watch? One of the reasons I retired from casting was due to the conflict of interest. SAG can fine a film a hefty chunk of change for putting a crew member in a film. In this circumstance I was the casting assistant on 21JS. The hilarious & brilliantly talented Phil Lord & Chris Miller were directing. I had the honor of being the reader opposite of all the actors both in their audition and callback. Mid production they called Liz Coulon, C.S.A (local CD on the show) and said “we need a girl-We’re adding a scene on the bridge. She should be attractive, great with improv, and not starstruck by Channing Tatum or Jonah Hill. It works tomorrow” Liz called in a handful of gals for and put them on tape to submit. She asked me if I wanted to do it as well as a wild card and I said YES! of course! She submitted the tapes to the guys and they called back with a resounding unanimous vote for me! 🙂 We’d worked together closely in the room for the callbacks so they knew the improv wouldn’t be an issue and I was delighted to take on the role. We were quite literally “boxed in” on the Crescent City Connection with zero access to move about much once on the bridge. Our staging area for the day was like a party bus where Channing, Jonah, & myself would wait when weren’t rolling. I had an incredible time laughing and swapping stories with each of them off camera as well as creating/playing on camera as 90% of each take was improv. I had no idea what (if anything) they’d keep in the film. You worked on another project that is among one of my favorite films of all time, a darling sad tale known as Jeff Who Lives at Home. How was your experience working on this amazing film? Woooooooow! Excellent taste in films friend! The Duplass Brothers (from Louisiana) are dynamite! They were equally as amazing to work with as Phil & Chris. These guys are incredible film makers and hands on directors! I love that they share their vision but allow you to dream with them to make their vision a reality. If you were handed the role of any famous woman in American history, who would you want it to be? WHAT?! How can I limit myself to telling only ONE story?! That’s absolutely unfair; great question but absolutely unfair. *grumbles* No Pressure buuuuuuuuuut — Keely Smith; R.I.P. Keely led an incredible life of passion and performance in her 89 years. She was well known for her marriage to Louis Prima but theres an amazing story to be told there that I don’t feel anyone has highlighted. She was less well known for her thoughts on feminism in the 50s and decades after, she was Native American, she was a victim of Domestic Violence but got out in a time when divorce was unheard of/unaccepted, and to a famous man nonetheless. She took her joy of singing and performance to the next level developing a solo career and starring in multiple films, variety shows, & talk shows. She was absolutely relevant up to the end and remains a powerful woman in my eyes. My sweaty 6 year old son running into the dugout after his second ever game to give me a hug and thank me for helping him win!